(Nanowerk News) Energy loss in optical systems, such as lasers, is a chief hindrance to their performance and efficiency, and it occurs on an ongoing, frustrating basis. To help laser systems overcome loss, operators often pump the system with an overabundance of photons, or light packets, to achieve optical gain. But now engineers at Washington University in St. Louis have shown a new way to reverse or eliminate such loss by, ironically, adding loss to a laser system to actually reap energy gains. In other words, they've invented a way to win by losing. The results were published in the Oct. 17 issue of the journal Science ("Loss-induced suppression and revival of lasing"). In a series of three experiments, Lan Yang, PhD, the Das Family Career Development Associate Professor in Electrical & Systems Engineering; Sahin Kaya Ozdemir, PhD, a research scientist; and Bo Peng, a graduate student in Yang's lab at Washington University, and their collaborators, Carl M. Bender, PhD, the Konneker Distinguished Professor of Physics at Washington University; Franco Nori, PhD, at RIKEN in Japan; and Stefan Rotter, PhD, at Vienna University of Technology in Austria, showed in a first experiment that they could change the coupling between two microresonators by changing their distance and introduce on-demand loss controllably to one of them. In a second experiment, by varying the loss, they manipulated the coupling regimes and estimated the intensity of light in the two resonators and surprisingly found an initial decrease in total intensity of the two resonators followed by an increase, and finally a rebirth of strong light intensity as the loss was increased. "The loss added beyond a critical value increased the total light intensity and its distribution between the resonators," Peng said. In a third experiment, the researchers report achieving two nonlinear phenomena, the Thermal Effect and a Raman gain in silica despite increasing loss. "Light intensity is a very important parameter in optical systems, and here we have provided a new route to increase light intensity by modulating loss in the system," Yang said. "Instead of the standard method of adding more energy into the system, we're offering a more energy-efficient method." "Too much of something can be really detrimental," Ozdemir said. "If you pump in more energy to get more laser intensity, and it's too strong, you can get a sudden drop in the laser performance. "It is counterintuitive and paradoxical to see that the lasing starts and its output power becomes higher and higher when more loss is introduced, that is, less pumping is used," Ozdemir said. "This turns the conventional textbook understanding of lasers upside down." Yang said that in addition to lasing improvements, their findings could lead to new schemes and techniques for controlling and reversing the effects of loss in various other physical systems, such as in photonic crystal activities, plasmonic structures and metamaterials. 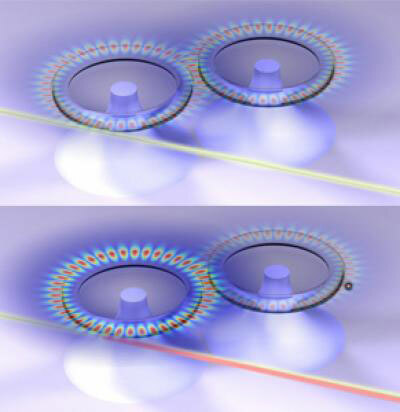 The experimental system that the researchers used consists of two tiny directly coupled silica microtoroid (doughnut-shaped) resonators, each coupled to a different fiber-taper coupler that aids in guiding light from a laser diode to photodetectors; the fiber is tapered in the middle so that light can between the fibers and the resonators. Yang said the concept will work in any coupled physical system. Loss is delivered to one of the microresonators by a tiny device, a chromium-coated silica nanotip, whose position within the evanescent field (leaked out light) of one of the resonator was controlled by a nanopositioner that operates at a minuscule 20-nanometer resolution. "Chromium is used because it's a strongly absorbing material at a wavelength of 1550 nanometers, and it gives a good dose of loss," Peng said. Another nanopositioner controls the coupling strength between the resonators by tuning their distance. The loss-gain phenomenon occurs near a feature called the exceptional point, which has a dramatic effect on a system's properties. The exceptional point has contributed to a number of counterintuitive activities and results in recent physics studies. "When we steer the system through the exceptional point, the symmetric distribution of the fields between two resonators become asymmetric," Ozdemir said. "Asymmetric distribution leads to field localization, increasing the light intensity in one of the resonators, in this case the resonator with less loss. As a result, all nonlinear processes, which depend on the intensity of light, in that subsystem become affected." "The beauty of this work is in how we came to provide new schemes and techniques to engineer a physical system by controlling loss," Yang said. "Normally, loss is considered bad, but we actually take advantage of this and reverse the bad effect. We used the laser to show it."